Former warrior queen and now pariah, Cold Zosia wakes in the ashes of a burning city. Her vengeance has brought her to this – her heroic reputation in tatters, her allies scattered far and wide, and her world on the cusp of ruin. General Ji-Hyeon has vanished into the legendary First Dark, leaving her lover Sullen alone to carry out the grim commands of a dead goddess. 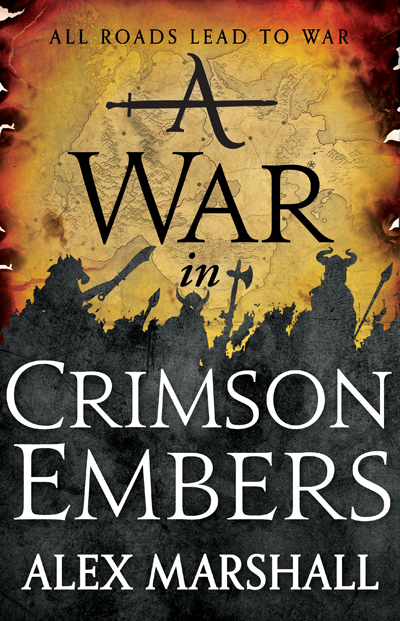 The barbarian Maroto is held captive by a demonic army hell-bent on the extermination of the Crimson Empire, and only his protege Purna believes he can be saved. Zosia must rally her comrades and old enemies one last time, for what will prove the greatest battle of her many legends …if anyone lives to tell it. Alex Marshall is a pseudonym for Jesse Bullington, acclaimed author of several novels in different genres including The Sad Tale of the Brothers Grossbart and The Enterprise of Death. He lives in the Pacific Northwest.